Cool faux-suede soft beige/cream ladies jacket. 96% Polyester. Beautiful soft material. Excellent condition, however waist belt is missing. ZARA Black Faux Leather Biker Jacket With Zips Quilted Detail Size M. Dispatched with eBay delivery – Shutl 1 day. New listingLadies Zara floral Belted jacket with Multiple Zip Detail, Pockets. UK Size M! Ladies Zara floral Belted jacket with Multiple Zip Detail, Pockets. UK Size M!. Condition is BRAND New with tags. Zara coat jacket size xs. Excellent Used condition no damaged no stains . 100% GENUINE & AUTHENTIC ZARA ITEM. Jacket with lapel collar, long sleeves, and zipped cuffs. ZARA Limited Rock & Roll Punk SUGAR SKULL STUDDED FAUX LEATHER PU JACKET S. Every Blogger and Celeb worth there fashion credentials are sporting all things studded and all things embroidered and this Sugar Skull Patch Biker Jacket from Zara is bang on trend on every level. 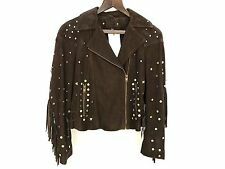 Zara Leather Look Black Biker Style Jacket -Size S with short sleeves, zipped pockets is in good condition. Very unusual model, looks so stylish. From home free of pets and smoke. Any questions please contact me. Also please check my other items. Zara Biker Style Jacket Size Mex 26 Fits Size 8 Colour Blue & Gold Fully Lined Zipped Up The Front.Has Only Been worn once perfect condition .Dispatched with Royal Mail 2nd class. V-neck with lapels. Long sleeves. Front zip closure. Side zipped pockets. Contrasting fabric. Lined.SIZE L.
Zara black faux leather jacket with quilted detailing. In my opinion it is a small fitting as these jackets usually are. BNWT SIZE XS. Jacket with lapel collar, long sleeves and zipped cuffs. Length Approx.19". Armpit to pit approx. HEIGHT OF MODEL: 178 cm. 100% polyester. A dark khaki coloured biker jacket from Zara Woman. Coat length from back neck to bottom hem: 26”. The material has a good degree of stretch to it making it comfortable to wear. Material: 61% polyester, 35% viscose, 4% elastane. Zara Navy 51% Wool Coat. High quality as expected from Zara. High wool content. Size 10-12 (M). ZARA Black Faux Leather Shearling Aviator Biker Jacket Coat. Faux Leather & Shearling. Oversized Fit, Belted Waist, Silver Zip Fastening, Zipped Pockets, Buckled Collar. If You Would Like an Item by a Certain Date, We Will Try Our Best to Provide This. A cool & edgy polyester biker jacket with a versatile look, providing the perfect blend of fashion. Machine Washable & Dry Clean. SOLD AS SEEN. 100% AUTHENTIC. Pit to pit: 17.2" Shoulder to hem: 21.6". IS FULLY LINED IN BLACK POLYESTER SILK. IS IN A VISCOSE/POLYURETHANE LEATHER LOOK. GREAT QUALITY. GOOD WEIGHT TO IT. Zara red faux biker leather jacket. Size Small. Gorgeous colour. Jacket with lapel collar, long sleeves and zipped cuffs. HEIGHT OF MODEL: 178 cm. CHOOSE A SIZE. 100% polyester. 100% polyurethane. Excellent condition Zara biker jacket with detachable (zip) fur collar and double hem buckles, labelled as size S (fits a regular UK10 EU38). Length: 55 cm. Sleeve length: 63 cm. chest: 47 cm. Studded sleeves and back. Zipped pockets. Zipped cuffs. Side hem tab. FAUX leather jacket from ZARA - good condition. Small hole in back of sleeve. Visible in last photo! Also tiniest visible wear on collar. Two side flapped faux pockets and is a fitted style jacket. a single rear vent, it is blue cotton lined, and is lightweight, not too heavy, and the brown tweed lambswool is very country looking. good styling with the hounds-toothed elbow patches, it is a single buttoned blazer, and with buttoned cuff details.